Well hello, Minerva Clark. How have I missed you up until now? 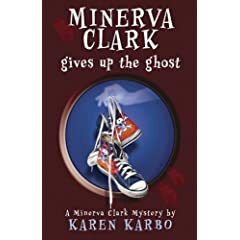 You're a sassy, smart, semi-angry Chuck-Taylor-wearing 13-year-old girl sleuth (with three older brothers), and you've starred in two previous books, yet, as far as I can remember, I've never heard your name. Rest assured, I now have a burning desire to read the first two installments in your saga. When Mr. Dagnitz was just plain old Weird Rolando, with his man braid and yoga pants, my brothers and I weren't required to bond. Now it was a whole new deal. An electric shock had not nearly killed me, but it had done some weird things with my mind. Like just about every teenage girl, I used to despise myself. Now, for a reason that no one could explain, I thought I was okay just the way I was. Because I wasn't thinking about how I appeared to people all the time, I was more perceptive than the average kid. I could see what was going on with people. I liked how he called me babe, even though it sort of sounded like something he'd practiced at home in the mirror, winking and pointing at himself with finger guns. "Well, thanks," I said. "You're incredibly awesome, too." It only seemed polite to say that back, even though I didn't quite mean it the way Angus did. I meant it more like the old-fashioned meaning of "awesome," as in "I'm in awe at how weird you are." No person with half a brain believed in ghosts. It was like believing in unicorns, the Loch Ness monster, Big Foot, special personal angels who watched over you. I calmed down thinking of all the lame woo-woo things that did not exist, ghosts included. Like that girl in your class who's created a whole personality around being scared of spiders and bugs, he shrieked, high and loud. Okay, I admit it. She had me at "man braid and yoga pants". Just... awesome. Fans of Sammy Keyes will want to check this out. I must seek it out -- you had me at "man braid and yoga pants" too. -- and me. Man, braid?? ?